brostenen wrote: CRT's with speakers, were quite common in the Amiga days. Apple made a bunch of Mac CRT's for the PowerPC line in the mid-90's as well. On PC, they tried to make it populair in 1995/97 as well. Never quite caught on though. Im having regrets about not grabbing it. If I'm in town in the next couple of days (and its still there, and we dont have any more bad weather) I may very well grab it and see how it cleans up. Fortune favors me. I'm heading into town tomorrow for an interview. I'm going to stealth by there and grab the monitor whIle I'm there. I've spent the last few days getting frustrated at sound cards - specifically my inability to successfully operate / repair my AWE64 Gold, which I really don't have much I need to do with other than satisfy my curiosity / pride at this stage. Working on organizing stuff again into their respective big plastic bins. I think I am going to run out of anti-static bags yet again. Then onto finishing my 486 build. 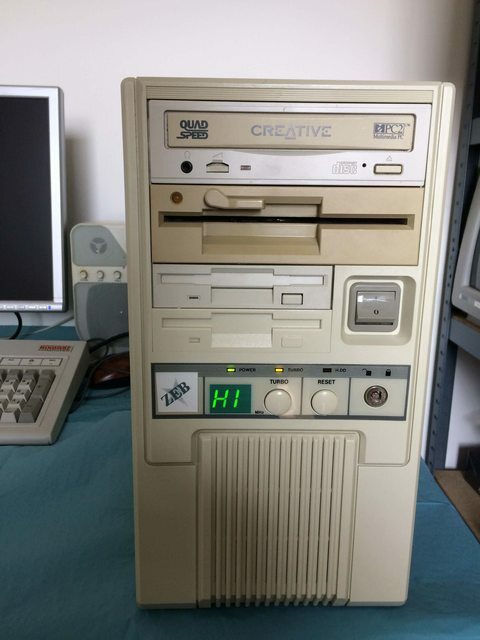 any pics of your 486? Saved one of my 486 boards from a battery related death. Caught it just as it was starting to affect other components near it. Not using the board for anything but it was from one of the machines that got me through college so its mostly held onto for senitmenal reasons. Trying to work out why my Dell 466/L is having clock issues. Turns out the clock chip is only getting half the voltage it was expecting (2.5vdc, should be 5vdc) so I need to try to work out the power chain and see where its dropping. If anyone has the schemantics/boardview for a Dell 466/L motherboard I would be very greatful (yeah, I know the chances are pretty much zero but if you don't ask you never know). I did manage to coax it into running its onboard diagnostic which failed with rtc vs timer fail, oh the joys. Grabbed it. Cleaned up ok. No damage to the glass. Also... is this a SonicTron? Aka a Viewsonic branded Trinitron. I've never seen a cage inside a CRT like that and I remember someone blithering on about the "heavy metal supports inside Trinitrons"
Edit: Hooked it up to the Pentium 133 build. Sounds nice and has better geometry now that I've jerry rigged the grounding pin. Looks really good too. Played some Duke3D and Xwing on it. A couple of recent purchases were tested last night. A Microsoft Force Feedback Wheel and pedals was tested with Sega Rally on a WinXP machine. Very cheap from a UK car boot sale. This is the USB version and requires no additional power. And a Microsoft Freestyle Pro gamepad was tested on the above machine with Motocross Madness and Shadows Of The Empire. This has a sensor inside so you can tilt the gamepad to move where you want to go. This came with a 15 pin plug and a 15 pin to USB adapter plug. And some Altec Lansing AC5 speakers. I also went to the Retro Computing event in Walsall near Birmingham, UK on Saturday just gone. It was very good indeed. I picked up a few games for the PS1, PS2 and Megadrive. I won't buy and more. I can't buy any more. There's no room to buy any more. I have the ACS5 speakers and they're okay for retro activities. Listening to metal, not so much. Nothing too productive, I was just messing about playing Jumpman on my XT, testing the Graphics output. I wasn't even really focusing or making any proper effort to play, also near bedtime and yet somehow I managed to complete all the Beginner levels with only 3 lives lost - something I couldn't manage when I WAS actually trying. Typical. and I remember someone blithering on about the "heavy metal supports inside Trinitrons"
Apart from some serious clearing up here (basically piling all my individually unsaleable modems, ISDN adapters, RTL8139, USB card readers, crap 1MB PCI and TNT2-M64 AGP VGA into one big lot and dumping it onto the local Craigslist-lookalike, and separately also listing a nice but hopelessly surplus to requirements Compaq 15" CRT for free pickup) I've been trying to clean the Case From Smoker Tar Hell. It's a Packard Bell Squarius II uATX minitower I posted here a while back, literally dripping with tar from almost two decades in the filthiest smoke I have ever seen. Any other case I would have thrown away (indeed I did throw away two other generic miditowers from the same batch, keeping only a motherboard, CPU and a nice Yamaha PCI sound card), but this one I specifically wanted. What I did not want was the tar and the smell. I really cannot overstate how bad it was. Just moving the case around left my fingers stinking so badly it didn't go away after washing my hands. - baby wipes. Normally great for removing dust and slight encrustation, but not even remotely up to this job. - vinegar in hot water. Managed to move some mess, but wasn't able to make a serious dent in the situation. - methylated spirit (i.e. alcohol). This - combined with a lot of scrubbing and continuously replacing paper was actually effective, at least on reasonably accessible areas. Unfortunately it did not remove the smell. - dilute ammonia mixture. Normally removes any fatty residue. Here a trial run on a corner seemed to somehow remove the top layer of paint without actually getting rid of all the tar first. Couldn't smell the smoke anymore either, but that could have been my nose being blasted by ammonia vapour. End result of about an hour and a half of this was a case with relatively clean large areas, but all the nooks and crannies were still filthy and even after all this work it still reeked. If I couldn't improve that, I'd have to bin it anyway. So I did the one thing left to try: chuck it all in the dishwasher. I was concerned this might corrode the steel and melt the plastic bits, but in the end it did neither and was remarkably effective at both removing the tar and the smell. Not sure I would ever consider this in cases less severe, but if it's the only alternative to having to throw it out, it's worth a shot. Too bad the display is a 2-digit one so I changed it to HI. Which components are you unhappy with? My 486 at the time did not have a speed indicator, but a friend of mine had set his to 99 in a similar situation. Just because it is possible, I want to put as much RAM on it as possible but somehow it won't let me go over 16MB. I checked the RAM table and I made some mistakes there but even with a correct RAM set, it refuses to boot and need to remove 2 sticks. I haven't gone through all of my sticks so probably one time it will boot with more than 16MB. Downside is that most of them are 8MB or less. I also wanted to use a VLB CL card since I never had VLB back in the days but or the card is defective or I am missing out on something because it doesn't show an image when inserted even though sometimes the monitor led indicates it's getting signal. Last edited by Murugan on 2018-5-28 @ 13:44, edited 1 time in total. I had 4MB on my DX33 and 8MB on my DX4-100 and thought they were plenty enough. Especially 8MB for Warp 3 was dream-like. 16MB was when I hit the Pentium era and my PII system had 32MB RAM. Even my PIII was down to 32MB at one point when one SIMM stick went bad, and I could live with it. RAM was very expensive for a very long time. But chances are big I won't be trying anytime soon to add more. Still have a few unfinished projects first. Are you talking about Wing Commander Privateer for MS-DOS?